With the launch of the Erasmus Mundus programme in 2004, the European Commission pursued a double objective. On the one hand, the programme was meant to contribute to the European higher education convergence process that started in the late 1980s with the Erasmus programme and is at the centre of the intergovernmental strategy under the Bologna process. In this context, the Erasmus Mundus joint programmes at masters and doctoral levels have contributed to strengthening the Bachelors-Masters- Doctoral cycle in many European countries where the masters level was not clearly identified and the doctoral level was often considered as an individual research path with limited involvement of the degree-awarding institution. On the other hand, the Erasmus Mundus programme aimed at increasing the worldwide attractiveness of European universities so as to allow them to compete more effectively with other world regions and attract the best international postgraduate students to their institutions. This objective has also been achieved thanks to the high-level scholarships the programme offered to the best postgraduate students worldwide who were invited to study and/or perform research activities in one of the 222 Erasmus Mundus joint programmes funded since the beginning of the programme. 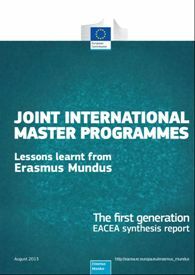 This synthesis report presents the main results achieved by the first generations of Erasmus Mundus joint programmes at master level. During a period of almost ten years (2004 to 2012) these programmes have trained more than 9000 students and offered almost 6000 high level scholarships to the best students from all over the world. Although the Erasmus Mundus programme will come to an end in December 2013, the two objectives described above will be further pursued and reinforced under the Joint Master Degree action of the upcoming integrated programme Erasmus+. Joint doctoral degrees will continue to be funded by the European Commission in the framework of the Marie Skłodowska-Curie Actions. As a result, the lessons learned from these pioneer courses should allow future applicant universities involved in setting up international joint study programmes to continue the convergence and attractiveness objectives initiated under the Erasmus Mundus programme. The present report is the result of the work of seven independent experts, who assessed the reports submitted by all 57 Erasmus Mundus Masters Courses selected between 2004 and 2006. This synthesis report was drafted by Dragana Avramov, with the support of other external experts and the Education Audiovisual and Culture Executive Agency, EACEA.